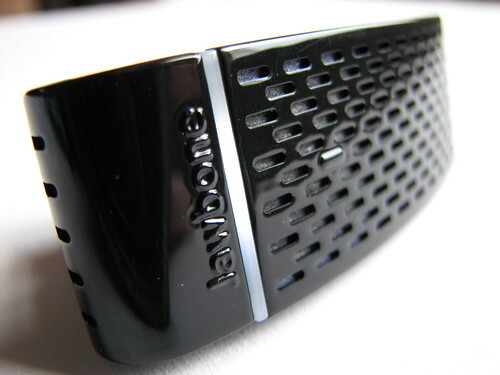 The Jawbone is really unlike any other headset I’ve seen before, the striking design screams to be looked at. So much that the elaborate packaging makes sure the design can be viewed at all angles and is the centre of attention – you definitely won’t miss this on a shop shelf. It’s oddly unique yet satisfyingly fashionable to wear, an important factor in today’s style conscious society. Available in three glossy metallic colours, black, silver and red. The construction of the headset feels very well built. 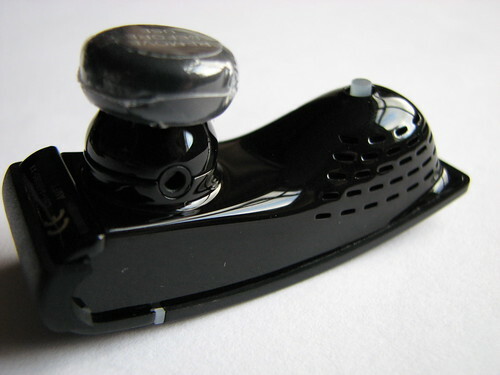 The inside curve is shaped to fit your face with the microphone section in contact with the side of your mouth providing maximum exposure to the vibrations from your voice. Everything has been thoughtfully considered on the Jawbone. Even the port for connecting up the power cable is cleverly concealed at the top end of the headset. 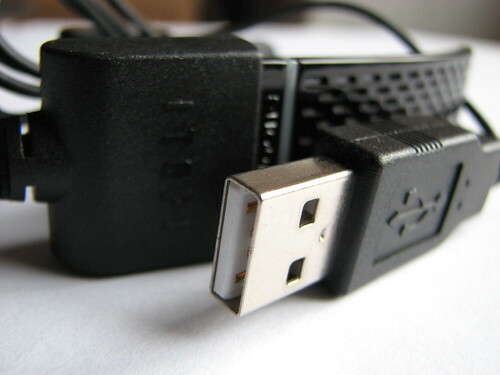 This is accessed by removing the rubber seal and then docking the adapter in to the port. Simplicity is what the Jawbone is all about. 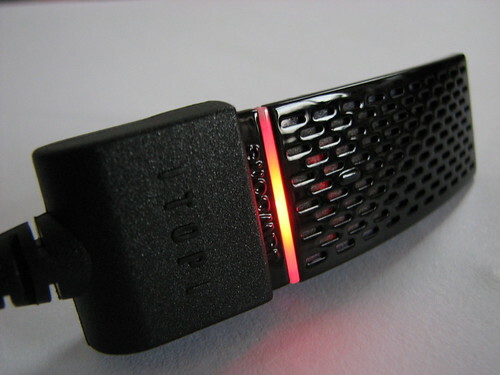 The headset has buttons designed in to the unit, just above and below the LED light. These two buttons give you access to the power and volume controls. Inside the packaging, you get a set of ear loops designed to fit your left or right ear with various sizes. Ear buds are also included to help fit the shape of your inner. The ear loop fit comfortably even after wearing for an hour, however the ear bud never seems to fit my ear very well and so any sudden turns or movements of my head will result in the bud portion of the headset popping out. Fortunately the ear loop segment is well designed that the whole headset doesn’t just drop off, however I think they could have made the earpiece a little bit smaller. The nature of the design means that the Jawbone isn’t a quick and easy job to put in. After a few practices you can get it in quite quickly but it requires two hands so if you’ve forgotten to put it on before you drive then you’re buggered. To get the Jawbone paired up with your phone, simply power it up by pressing the button below the LED line for three seconds then hit the button above the LED line for three seconds to put it in to pairing mode. I performed this twice on my Sony Ericsson K800i and the Nokia N95, and both were able to pair up without any issues. A common issue for cheaper Bluetooth headsets is background noise and interference, and as you would expect from the price bracket the Jawbone sits in, you get noise filtering to ensure your calls are crystal clear. The Jawbone has a feature called Noise Shield, this digital filter takes out all the background noise that you would expect to get from outdoor or busy environments such as in the car. Touted as the world’s first adaptive Bluetooth headset, the Jawbone supposedly eliminates all background noise from your call and continuously monitors the speech levels to ensure optimum quality. This is unlike noise filtering found in other headsets, which are either on or off and at one setting. 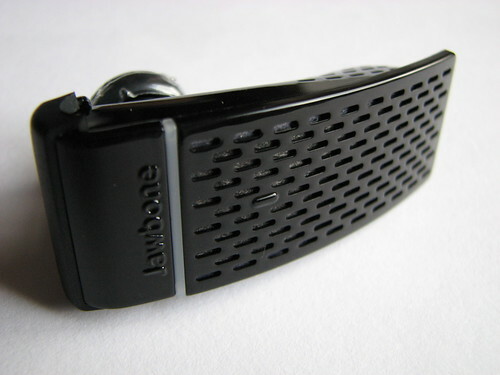 The Jawbone actively changes its voice equaliser settings depending on the environment you are in. Towards the tip of the Jawbone, a white button pops out, and as you’re wearing this headset, the white button comes in to contact with your cheek and senses when and how loud you’re talking to determine the signals from your voice and what’s background noise. The Noise Shield feature does work and callers were able to hear my voice clearly whilst driving on the motorway – a noisy and disruptive environment (depending on the car you’re in of course). The benefit of having this adaptive technology is that the noise filtering doesn’t always have to be switched on, because when it’s on you undoubtedly lose quality, so in quiet environments, the Noise Shield will dial itself down to improve speech quality as opposed to clarity when you’re in a noisy environment. The combination of sophisticated audio filtering technology, and chic-design helps elevate the Jawbone to new heights in earpiece design for Bluetooth headsets. Excellent sound quality and fast set up combined with its six hour battery means you’ve got a more than adequate Bluetooth headset. However, the fit isn’t the best due to its size. I hope to see in the next Jawbone release, a refined model that sheds some of the bulk form its design. The Jawbone is an excellent example of technology combined with design, however I don’t think it’s the perfect Bluetooth headset but if design is important to you, then you will no doubt find one of the three colours, much more appealing than some of the other models available on the market today.